As I told you last year, my family has a strange obsession with Peeps. These sugary, marshmallowy creatures always make their way into our home around the Easter holiday. The problem: nobody likes to eat them. Last year, in efforts to continue the Peep tradition, I made my own. 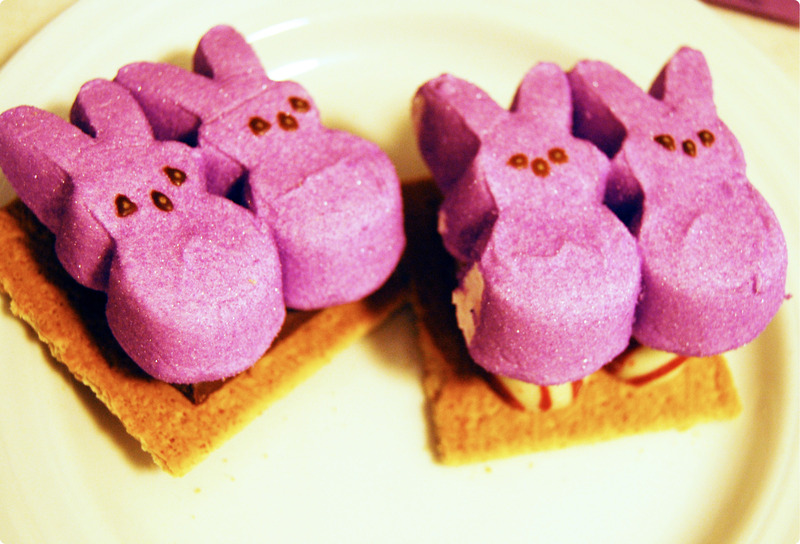 This year, I embarked upon a Peep journey to use them for something else besides eating them straight out of the box. I had grand visions of a Peep topiary centerpiece for my Easter table. It is half finished and a bit lack luster, not good enough to share. For those of you disappointed, rest assured, I will perfect and post it for next year’s Easter season. I was left with a box of purple bunnies that I did not know what to do with. 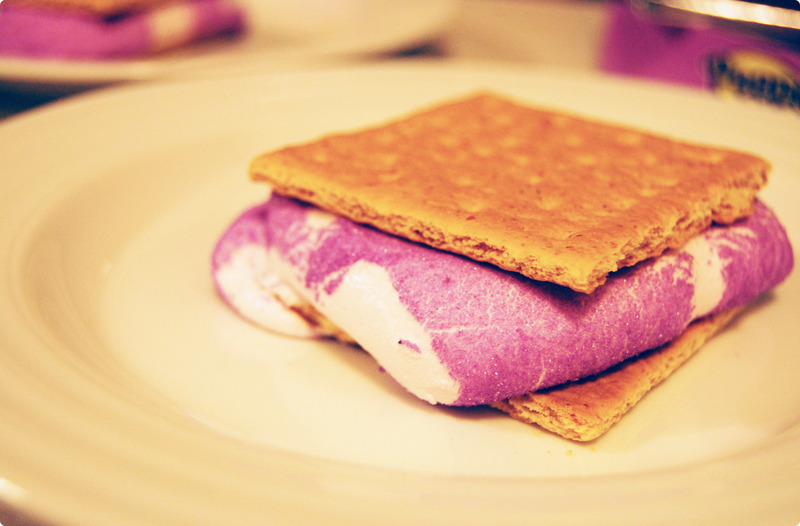 Looking for a little after dinner sweet, I rounded up some of the candy in the house, along with my son’s favorite “grahams” to make a microwavable Peep S’more. Surprisingly delicious and super quick, it is a great way to get rid of those fluffy critters that seem to invade your home and have a hard time making their way to the trash. Crack the graham cracker in half. Place two squares of chocolate or four Kisses/Hugs (I used the white chocolate raspberry Hugs) on the graham cracker. Top with one Peep chick or two Peep bunnies. Place in microwave. Cook on high for 15 seconds. Rest for a few seconds to make sure the Peep doesn’t explode (almost learned that the hard way), cook for 15 more seconds. 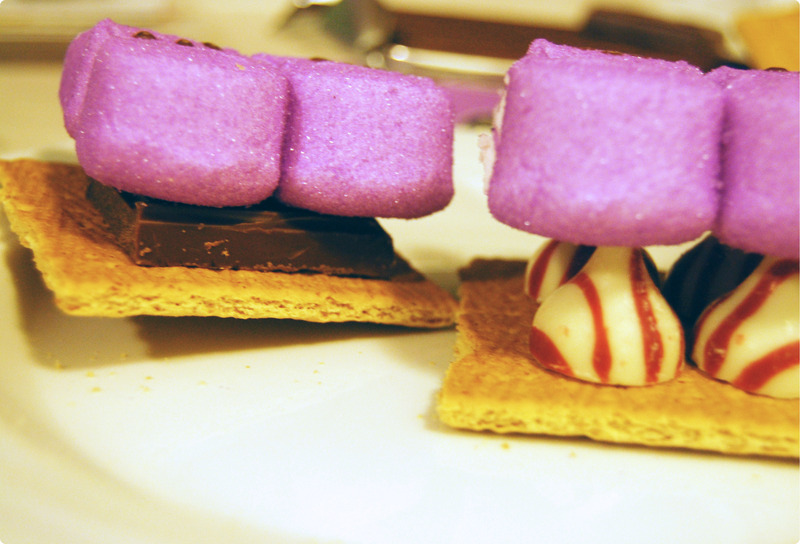 Place graham cracker on top and allow to sit for at least 30 seconds to let the chocolate melt. Wishing you a very blessed Easter! Hahaha!! I’m making these as we speak!! No lie! Love ya!